Oh, ASC. I heart you. Let me take you back many years- in 2003, I was still a wee little undergrad in Pennsylvania while my big sister was wrapping up her undergrad years in Maryland. For a lark, she and come of her college friends drove down to a little place called Staunton, VA to see a play they'd never heard of: The Knight of the Burning Pestle. Several years later, after we'd both gotten shiny pieces of paper with Latin words on it and had both relocated to DC, she described the performance to me. More than anything else she'd seen since, she related, Pestle just WORKED in the Blackfriars, with its crazy metatheatricality and wacky humor- a great play that perfectly suited the company style. I found a copy of the text at the great Capitol Hill Books (so filled with books that they're literally in the kitchen sink) and fell in love with the play myself, and once I, too, made the great trek southwards to Staunton (ok, it's less than 3 hours south of DC, whatever, I like the word 'trek'), I could imagine how it might play there. FINALLY, the ASC has mounted the show again- it's been touring the country for the last six months, along with productions of Romeo and Juliet and All's Well That Ends Well before coming home to the Blackfriars for the Spring Season. Being a junkie of both Early Modern theatre and the American Shakespeare Center, it was inevitable that I'd jump at the first chance I had to see Pestle. My hopes were high, but I knew that if anyone could pull off the show to my expectations, it'd be this company in this place. AND OH, HOW THEY SUCCEEDED. Let me see if I can try to capture why you must see this play at the Blackfriars if you have ANY opportunity before it closes this month. For some reason, nobody KNOWS this play unless they're Early Modern theatre geeks like myself, or are lucky enough to catch a rare production. It's a fabulous set-up, concerning a mediocre play that gets quickly interrupted by a grocer and his wife from the audience, who are convinced that their apprentice, Rafe, can improve the play by acting as a grocer errant playing scenes that they suggest. The players agree and the two plots commence, with plenty of suggestions, criticisms, and other assorted commentary from the grocer and his wife. The ASC's playing style has always been about engaging directly with the audience, which is exactly what the play calls for- which means they have exactly the skills to make this work. Another thing the ASC is known for is its knack for taking Early Modern principles and translating them into the present. Take costumes- EM costumes would have communicated a LOT to the audience about the characters wearing them, so oftentimes, the ASC will use modern, anachronistic costumes that communicate the same information quickly to a modern audience. 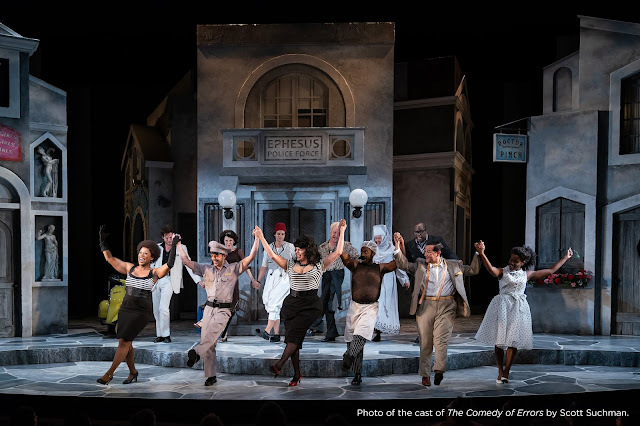 Pestle features a number of songs and references that modern audiences haven't a chance of recognizing in the way that the original Blackfriars audience would have done, so this production subs in modern references that serve the same function. Jarring as it might be to hear talk of Mamma Mia, we get the joke instantly and we know exactly what the grocer's wife's complaints are implying. The same thing happens with all of the musical references in the play, and there are PLENTY- just wait for the lovers' duet. The performances are stellar- Rick Blunt's Rafe is both adorable and nobly majestic (you try out that combination some time), Curt Foy and Ginna Hoben as the grocer and his wife play an all too recognizable modern couple (just as fun to watch when they're speaking as when they're watching the action on stage), Brandi Rhome and Josh Carpenter are a stylized delight as the lovers, and the slow burn of James Patrick Nelson's reluctant squire is a joy. There's also Aidan O'Reilly's vaudevillian Merrythought, David Zimmerman as his sailor-suited son... It goes on. There's not a single weak link in the production, and when everyone gets to steal the limelight so shamelessly, no one is left out. A special shout-out needs to go to Erin West's costume and makeup design- the clowns of the acting troupe are PERFECTION, from Venturewell's coat to Luce's pink and blue confection of a dress, and Rafe's slumping entrance on stage from the audience is wonderfully aided by what he wears. Jim Warren's production gets it. It gets the play, it gets what audiences like, and it gets what the cast can DO. I'm so glad I finally got to see this play and that it was such a gem of production. GET THEE TO THE BLACKFRIARS, GENTLE READERS. You can't miss this one.